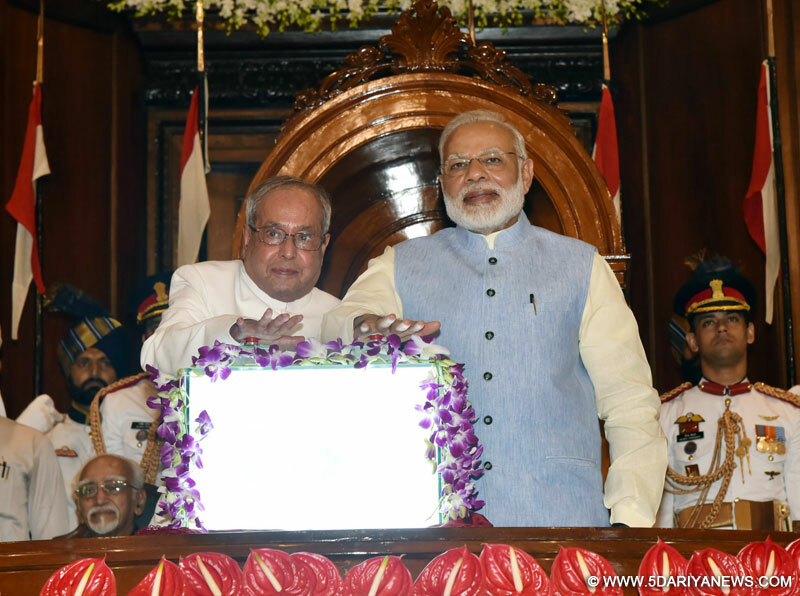 The President, Shri Pranab Mukherjee and the Prime Minister, Shri Narendra Modi pressing the buzzer to launch the Goods & Service Tax (GST), in Central Hall of Parliament, in New Delhi, in the midnight of June 30- July 01, 2017. The Goods and Services Tax (GST), India's biggest tax reform since Independence, rolled out past midnight Friday in the precincts of the hallowed Central Hall of Parliament to usher in a new indirect tax regime in an event that sought to evoke memories of the famous 'Tryst with Destiny' night the country got freedom in 1947.A minute after the stroke of midnight, President Pranab Mukherjee and Prime Minister Narendra Modi pressed the button to launch the new indirect tax regime on a digital screen with "GST" emblazoned on it in a golden hue.Conceived on the principle of 'one nation, one tax, one market', the tax that subsumes 17 central and state levies was launched in the presence of Vice President Hamid Ansari, former Prime Minister H.D. Deve Gowda, Lok Sabha Speaker Sumitra Mahajan, Finance Minister Arun Jaitley, MPs, chief ministers, state finance ministers, officials of the Centre and states.Notwithstanding the fact that the GST Law was a consensus product evolved over 14 years, the function in colorfully-decked Parliament House was boycotted by major opposition parties like Congress, Trinamool Congress, RJD, DMK and Left parties, saying the government was making a spectacle of a legislation for self-promotion, a charge Jaitley rejected. In keeping with his party's decision, former Primer Minister Manmohan Singh kept away from the event. However, MPs and leaders of Congress allies NCP and Samajwadi Party attended the function. Addressing the gathering, President Pranab Mukherjee said the introduction of GST is a moment of precedent for the country and a matter of personal satisfaction for him because of his role as Finance Minister earlier. "I had always believed that GST was a matter of time and was happy when it was enacted and I gave assent to the Constitution amendment last year," he said.He said the new law is a tribute to the maturity and wisdom of Indian democracy. The GST Council was a unique experiment under the Indian Constitution because of the shared sovereignty.In his speech, Modi said the roll out of GST is the best example of cooperative federalism and success of Indian democracy. "The credit for the new law does not go to one party or one government but was a shared legacy of all," he said.In a veiled rejoinder to opposition criticism of the midnight function in Parliament, the Prime Minister said there cannot be a "better and sacred" venue than the Central Hall for the historic roll out.The GST process cannot be confined to just economic system but was a collective effort of all, he said, adding it was a product of long discussions among the best brains of the country. "It is an example of Team India's strength and ability," he said. Referring to the eminent personalities like Jawaharlal Nehru, Sardar Patel, Maulana Abul Kalam Azad and Babu Rajendra Prasad who had adorned the Central Hall, Modi said like Patel had integrated the country, the GST would integrate the country economically.He described the GST as 'Good and Simple Tax' -- good because there will be no tax on tax and simple because there will be only one form of tax. It will also help eliminate black money and corruption because of the transparency it seeks to bring in, he said.Modi said whatever was lacking in growth and development of the country, GST will provide the opportunity to realise them.Ahead of the launch, the GST Council slashed the rate of fertilisers from 12 per cent to 5 per cent and of exclusive parts of tractors from 28 per cent to 18 per cent to reduce the burden on farmers.The launch of GST, which the government claimed would result in reduction of prices of articles of common consumption, also came amidst fears from various business sections that prices would go up under the new regime.Welcoming the gathering, Jaitley described GST as the biggest and most ambitious tax reform which is an achievement of the country through consensus. It highlights the fact that India can rise above narrow politics and work for country's benefit. In making the GST, neither the Centre nor the states gave up their sovereignty.He said all MPs, state governments, political parties, state finance ministers and dedicated officials of the Centre and states deserved to be appreciated for realising the project of GST Law.Jaitley said under GST, the revenues will go up as the compliance goes up and the GDP will also increase. Parliament's Central Hall has witnessed such a function only on three occasions earlier. First was on the occasion of Independence when first Prime Minister Jawaharlal Nehru made the famous 'Tryst with Destiny' speech. The second was on the occasion of silver jubilee of Independence in 1972 and golden jubilee in 1997.The GST is expected to check tax evasion and broaden tax base. In the new regime, all filings will be done only through electronic mode to ensure non-intrusive administration. This will minimise taxpayers' physical interaction with the tax officials.The GST regime seeks to reduce rates of over 50 per cent of items of daily use and charge others at much lower rate of 5 per cent, 12 per cent and 18 per cent.A higher tax rate is imposed on luxury and sin goods at 28 per cent in the new regime. Certain services like telephone, banking and insurance are expected to feel the pinch of higher taxes.The GST also promises taxpayers a refund against their sales within 60 days. Similarly, exporters will get refund within seven days. For protection of consumer rights, the new law provides anti-profiteering provisions. In a departure from the normal practice, the GST will be administered together by the Centre and the states.